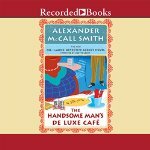 This is the 15th book in the Ladies #1 Detective series which Alexander McCall Smith began back in 1998. I read about it back then in some magazine or review and promptly got the book. Yup – I was hooked. And here I am 16 years later still gobbling them up the day they are released. I have had paperbacks (at first) and hardcovers (for a few years before ebooks) and now (for the last 10 or so years) I prefer listening because Lissette Lecat is the perfect reader for this series. ** Please! ** If you feel like reading one of these books get the first one “The Ladies #1 Detective Agency” ! The character development is the main reason folks like myself are so enamored of the series. What will happen next to Mm Precious Ramotswe and Mma Grace Makutsi, and how they deal with it, is what keeps us coming back. There is always a little mystery associated with some customer but there are better crime novels on the market – there’s only one Precious Ramotswe. The detective agency is located in the extraordinarily civilized Gaborone, Botswana (about which much could be said) and the proprietor of the agency and protagonist of the series is Mm Ramotswe a woman … (lol) “of traditional proportions.” They drink a lot of bush tea and travel in a little old white van. But this time, after taking on a client with a houseguest who has amnesia, Grace Makuti has decides to open a little cafe. Her husband, Phuti Radiphuti a furniture store owner, agrees. Precious and her husband, Mr. J.L.B. Matekoni, a mechanic, also agree. But they, and we, certainly do wonder how that will work out.